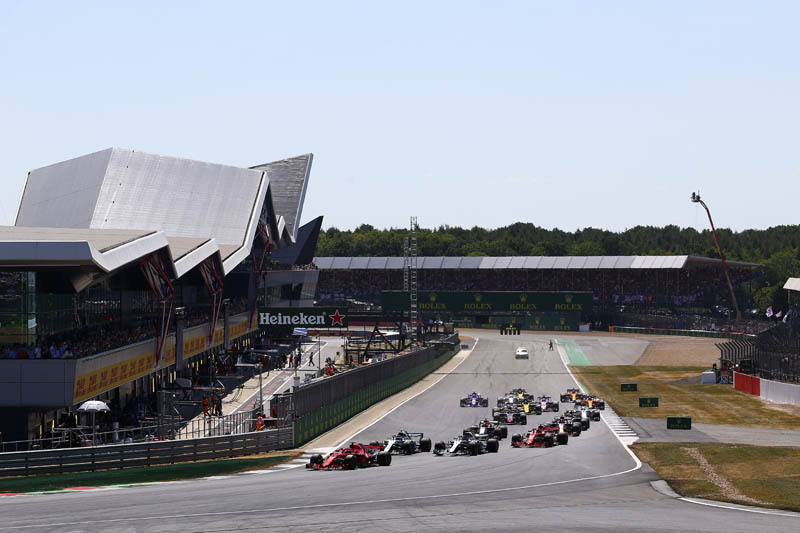 Over the years there were times when it seemed Bernie Ecclestone wanted a race at any venue other than Silverstone, such was his hostility towards the Northamptonshire circuit and its owners, the British Racing Drivers Club. Describing it as a run-down, dilapidated old house, among other things, and an embarrassment, the Briton tried - and failed - to find a suitable alternative to the track which hosted the first ever round of the Formula One World Championship in 1950. However, as the sport prepares to celebrate the 1,000th Grand Prix in China, Ecclestone says every effort should have been made to switch the calendar around in order that Silverstone hosted the historic event. Indeed, Ecclestone insists that though running the race in April would impact Silverstone financially, any loss should have been covered by the sport's owners, which is something he would have done were he still in charge. "The Silverstone people would be worried about losing out on revenue," he told the Daily Mail, "so I would have made sure we made up the difference from Formula One's own pockets. "It would have been super to have the 1,000th race there," he admitted. "It is such an important part of the heritage of F1, it would have been nice to recognise that." As British race fans smile at his talk of Silverstone and heritage in the same breath, they will shudder at the last time the Northamptonshire track hosted a race in April 2000. With the British weather unfavourable at the best of times, heavy rain for days prior to - and during - the event, combined with poor drainage and bad planning turned the car parks - such as they were - into a quagmire, with the end result being delays for fans heading to the track throughout the weekend and the police advising many race fans to turn around and head home. The switch to the April date back then was purely and simply a warning shot across the BRDC's bows at the height of Ecclestone's battle with the tracks owners. Indeed, when Ecclestone was subsequently asked what time of year the 2001 race might be held, the Briton famously replied: "I'm not sure, but I'd keep Christmas week free". The sport's bosses did approach Silverstone to see if it was interested in hosting the 1,000 the Grand Prix, but clearly the 2000 event is firmly fixed in its memory. "Moving dates is never something we considered seriously," said Silverstone chief executive, Stuart Pringle. "It was thoughtful of F1 to give us first refusal on it. "But we always felt it was better to stick to July 14," he admitted. "People want motor racing in its traditional British summer slot. It was almost guaranteed not to be a success, when we are trying to make the British Grand Prix viable." Other than the suitability of China - which only hosted its first F1 Grand Prix in 2004 - as host of the 1,000th round of the world championship, there is the question mark over how accurate it is to describe it as the 1,000th race as between 1950 and 1960 the Indianapolis 500 was included in the world championship even though there was barely any participation by F1 teams or drivers, and in 1952 and 1953 the sport was run to Formula 2 rules. And while the BRDC may be thankful to Formula One Management for the offer to switch dates, it would surely prefer the sport's owners to be as compromising in terms of its hosting fee, this year's event being the last as the circuit and Liberty Media seek to agree a new deal that will satisfy all. Check out our Thursday gallery from Shanghai, here. "I wish I could count! What I should have said was to celebrate the PLATINUM (70th) Anniversary of the first race at Silverstone"
"Silverstone, even in July could be chilly - there are very localised weather patterns around the circuit that keeps it several degrees cooler than the surrounding area. Had it been this weekend, likely temperatures are in the region of 8/9C maximum, and chances of rain. That's more like RAC Rally weather!!! Maybe better that F1 plans a special celebration for the 2020 British GP as the Diamond Jubilee of the first ever F1 Championship GP. " Where are the most knowledgeable fans in F1? Where is all the history of F1? Where are all the famous circuits in F1? Where is the manufacturing base of F1? Where is the strength in depth of F1? Where are the future drivers coming up through the ranks to F1? So where shall we celebrate (sort of celebrate, as its not actually the 1000th race) this milestone? Well obviously it must be China. It’s a ‘destination’ venue and easily accessible for the rest of the world, you just need planes & hotels, oh and a good credit card. It’s been an emerging market since 2004 as the people are so wealthy there. It should be emerged anytime soon. There are plenty of local drivers. It could all go behind a Paywall as well.
" "so I would have made sure we made up the difference from Formula One's own pockets"
your mouth is, is very hypocritical. You willingly sold F1 to, I am sure of that you knew, a bunch of half-wits. I think it's best for you to "hold forever silence""